Published 4 weeks ago. About a 5 minute read. As the veggie diet revolution continues to gain ground, we look at plant-based doppelgangers of two of our most beloved animal-based foods — beef and tuna — and why they could be key ingredients in our efforts to save the planet from ourselves. First, Impossible Foods has published a comprehensive life cycle assessment on Impossible Burger 2.0, the new recipe for the food tech startup’s award-winning, plant-based meat. The LCA confirms that when consumers buy an Impossible Burger instead of a beef burger, they reduce their impact across every significant environmental category, including land use, freshwater use, greenhouse gas emissions and aquatic pollution from runoff. According to the objective, third party-validated report from Quantis, Impossible Burger 2.0 — the first product upgrade from Impossible Foods since the 2016 debut of the Impossible Burger — is more sustainable than Impossible’s original product, and vastly better for the planet than ground beef. Shortly after its founding in 2011, Impossible Foods’ scientists discovered that one molecule — “heme” — is uniquely responsible for the explosion of flavors that results when meat is cooked. Impossible Foods’ scientists genetically engineer and ferment yeast to produce a heme protein naturally found in plants, called soy leghemoglobin; the heme in Impossible Burger is identical to the essential heme humans have been consuming for hundreds of thousands of years in meat. Earlier this year, Impossible Foods launched its first product upgrade at the International Consumer Electronics Show (CES), where Impossible Burger 2.0 took home the show’s highest honors. Impossible Burger is now served at thousands of restaurants across the US, Hong Kong, Macau and Singapore; and just this week, Roots drummer Questlove launched a namesake cheesesteak sandwich made with Impossible Meat. As Questlove told Forbes: “When I first tasted Impossible Meat in 2015, I became obsessed with the product and the company.” In 2017, the musician joined the ranks of Impossible's investors. 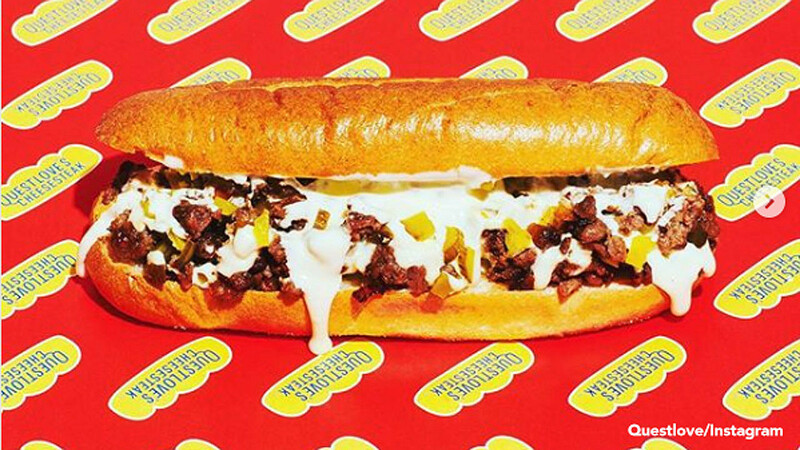 According to Forbes, “Questlove’s Cheesesteak” will be available beginning March 28 at Philadelphia’s Citizens Bank Park during all 81 Philadelphia Phillies home baseball games this season; and over the coming months, the cheesesteak will be featured on menus at 40 Live Nation-owned and -operated venues across the US (last year, Live Nation was the first to bring Impossible Meat to concert venues, with the addition of the Impossible Burger at 35 venues). Later this year, the burger is expected to debut in US grocery stores — alongside its rival in the plant-based burger revolution, the Beyond Burger. Meanwhile, with plant-based eating on the rise, Atlantic Natural Foods’ (ANF) Loma Linda® branded line of better-for-you, plant-based, shelf-stable foods is continuing to disrupt the global marketplace with TUNO™, its fishless canned seafood made with a proprietary blend of soy, seaweed, yeast, sunflower oil and other natural ingredients. With consumer adoption for plant-based foods increasing daily, Loma Linda has now placed TUNO at retailers worldwide — including the US, Australia and the UK — on a mission to provide affordable, sustainable and healthy sources for plant-based food for all lifestyles and taste preferences around the globe. "Overfishing is a global problem that's getting worse by the day. With the Atlantic and Indian Oceans under siege — and the Pacific under review — our latest innovation, TUNO, is addressing the long-term need for alternate protein sources," said ANF founder and chairman J. Douglas Hines, a 40-year veteran in fisheries. "Yet the unsustainability of tuna is only part of the issue — other oceanic pollutants like microplastics are also a real concern; TUNO gives people a delicious, shelf-stable and earth-conscious solution." Two-thirds of consumers (66 percent)1 already regularly or sometimes eat plant-based, while another 44 percent2 are actively trying to incorporate more plant-based foods into their diets. As meatless meats and vegan cheeses began gaining momentum at a rapid pace, Hines saw a real need for fishless seafood options that everyone could enjoy. "Plant-based seafood options have historically been associated with expensive price tags and paltry nutritional content," Hines said. "With TUNO priced at just $1.99 per can, packed with high protein and Omega-3s, with comparable texture and taste, it rivals traditional canned tuna in many ways." Loma Linda's TUNO, available in easy-open cans and a convenient 3 oz. pouch in flavors including Sriracha, Lemon Pepper, Thai Sweet Chili and Sesame Ginger, is now available at retailers including Walmart, Shaw's, Sprouts, Food Lion, Ingles, Jewel and Meijer; and will soon be on shelves at leading retailers in Australia and in the UK, as well as at many specialty grocers and online at Amazon and Zulily, with more to come this year.